KIOCL plant section collapses - 3 killed. Kudremukh, Mar 23, 2015 : (Chikkamagalur district) : Reports state 3 persons were killed on the spot when the third floor of the iron ore plant belonging to KIOCL (Kudremukh Iron Ore Company Limited), collapsed on them on March 22, morning. With mining activities suspended by KIOCL, a Chennai-based company, Annam Steels, was in the process of dismantling the three-floored building, more than a 100-feet high, for the last six months. 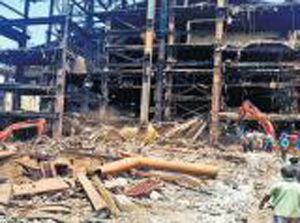 Workers were working on the ground floor, when the third floor caved in suddenly, at around 11 am, killing three persons on the spot. It is said that on Saturday, the third floor had been partially demolished. Unaware of this, a few workers began work on the ground floor. The vibrations shook the third floor and collapsed. .
Three earthmovers in a 5-hour rescue task cleared the debris that weighed hundreds of tonnes, to recouver bodies. Kundan, a native of Bihar, Shankar (45), a native of Odisha and Sunil (30), a mason, are said to be the victims. The Kudremukh police are camping on the plant site. Four others injured in the incident, have been admitted to the community health centre at Kalasa, co-ordination is seen as the culprit.